Say, the feisty local tabloid is on some awards run, yeah? A mere one week after garnering a coveted Today’s Top Ten Front Pages award from the Newseum, the Boston Herald has done it again! If you like your state politics with a touch of scandal, it’s a good week to be reading the newspapers. As “Bridge-Gate” continues, today’s headlines focus on Gov. Chris Christie’s epic, apologetic news conference. Look for tomorrow’s Herald to devote meaningless real estate in the news hole to this precious award. P.S. 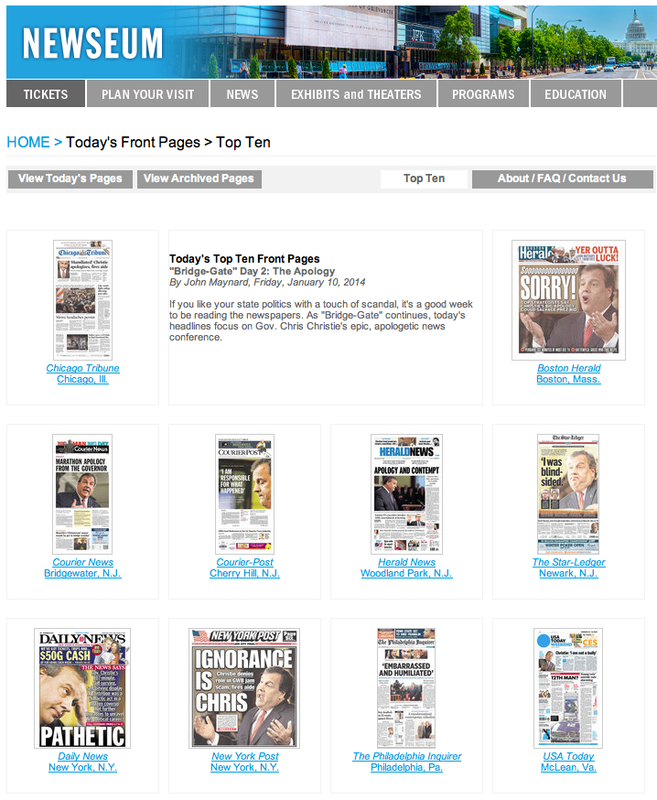 That’s two Top Tens in two days of Christiepalooza for The Courier News, Philadelphia Inquirer, Star-Ledger, and New York Post. Something to shoot for, eh, Heraldniks? This entry was posted on Friday, January 10th, 2014 at 3:04 pm and is filed under Uncategorized. You can follow any responses to this entry through the RSS 2.0 feed. You can leave a response, or trackback from your own site.